Contact Displays - Portable Display Stands Products - CAR GRAPHICS, VEHICLE GRAPHICS - roll up, banner stands, banner, pull up, pop up, table promo, plinth, screens, walls, prints, sticker, light box, brochure holder, catalogue holder, flags, tear drop banner, admats, vehicle graphics, inflatables, promo items, outdoor banners, outdoor display, vinyl, pvc, canvas, polypropylene, gloss paper, gloss art, fabric, material fabric. Turn your car, truck, van or your entire fleet into an advertising machine. 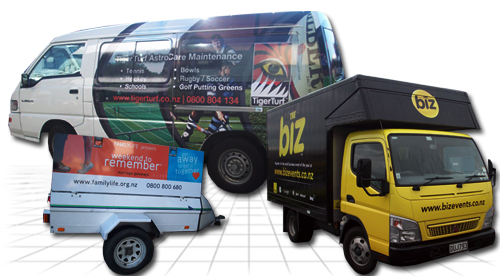 Vehicle Graphics are a good option for businesses to gain extra exposure around town or across the country. Vehicle Graphics are a smart advertising investment, that will help you get your name out there, car door magnets are also available. Please call us for a quote. Copyright 2012 Contact Displays Ltd. All rights reserved.